Don Burleson points out that Oracle has sent out some Cardboard laptops! â€œTo derive maximum benefit from your business critical content, you need to share it across a wide user base. But the more people who have access to it, the greater the threat of sensitive information leaking to your competitors. Thatâ€™s just for starters; content proliferation also raises the risk of regulatory non-compliance and escalating management costs. You know you canâ€™t live without your information, but youâ€™d be forgiven for wondering how to live with it. Oracleâ€™s recently acquired Information Rights Management solution can help. A key component of our Document and Records Management portfolio, it enables you to share your information when and with whom you want – without fear of the outside world. But it doesnâ€™t stop there. Should the worst happen – and your laptop falls into unsafe hands – we can even scamble your content before anyone works out how to access it. So what’s the story? What bandwagon is Oracle getting on here? Only time will tell. Burleson thinks it may be another step in their “unbreakable” theme. I think it may be something with Application Express as a content management system. Something to do with enterprise blogs or wiki or some other web 2.0 kind of content management. Posted on July 9, 2007 July 10, 2007 Categories Blogs, Database Administration, Information Technology, Internet, Oracle, System Administration, TechnologyTags blog, dba, dbms, laptop, marketing, Oracle, RDBMS, web, web 2.0, web2.0, wiki1 Comment on Where’s my cardboard laptop? After my first response to Donald Burleson’s article The web is becoming a dictatorship of idiots Donald responded. Here is his response followed by my response to him. Here are my guidelines for finding credible information on the web, and advice on how-to weed-out crap, sound advice. In my opinion (and in my own interest) I think everyone should be able to publish anything at anytime. Me to. I’m all for free speech, but it’s the search engines problem that they cannot distinguish between good and bad information. I don’t like the “clutter” it’s causing for the search engines. It ruins my ability to find credible sources of technical information, and I have to wade through pages of total crap from anonymous “experts”. For example, scumbags are stealing credible people’s content and re-publishing it in their own names, with free abandon. Look at what has been stolen from Dr. Hall. So the system can (and will eventually) balance itself. I disagree, not until “anon” publications and copied crap is unindexed from the search engines. If I’m using Google to find technical information I give zero credibility to anonymous sources, and it would be great to have a “credible” way to search the web for people, so they can find stuff from folks like us, who publish our credentials. We’re in the information age and the flood gates have opened! Flood is the right word. Some of the Oracle “experts” who publish today would never have been able to publish in-print, and for very good reason. There are many self-proclaimed “experts” all over the web, people without appropriate education or background who would never be published in traditional media. And just like “Essjay” on Wikipedia, many of them either fabricate of exaggerate their credentials. They carefully hide their credential (resume or CV), so nobody knows the truth. I disagree, it’s not “culture”, it’s a simple credibility issue. And what about Wikipedia? Any 9th-grade dropout crackhead can over-write the work of a Rhodes scholar. That’s not a culture issue, it’s about credibility. It’s a dictatorship of idiots. One bossy Wikipedia editor tossed-about his credentials (“a tenured professor of religion at a private university” with “a PhD. in theology and a degree in canon law.”), when in reality he is a college dropout, a liar and a giant loser. Wikipedia is the enemy of anyone who wants to find credible data on the web, and they are actively seeking to pollute the web with anon garbage. Read this for details. It’s the balance between free speech and credibility. Just the raw link-to counts are deceiving. I hear that the #1 Oracle blogger got there only because he wrote a hugely successful blog template, totally unrelated to his Oracle content quality. The solution is simple. Sooner or later, someone will come-up with a “verified credentials” service where netizens pay a free and an independent body verifies their college degrees, published research, job experience and other qualifications. Until then, netizens must suffer the dictatorship of idiots, never sure if what they are reading is by someone who is qualified to pontificate on the subject. I do Oracle forensics, and the courts have very simple rules to determine of someone is qualified to testify as an expert, and there is no reason that these criteria cannot be applied on the web, assigning high rank to the qualified and obscurity to the dolts. Until then we must suffer weeding through page-after-page of questionable publications in our search results. itâ€™s the search engines problem that they cannot distinguish between good and bad information. I donâ€™t like the â€œclutterâ€ itâ€™s causing for the search engines. Thereâ€™s no doubt that web indexing and searching is an imperfect science but identifying the quality of resources is beyond its scope. Search engines like Google, Yahoo and MSN should be considered tools to help find a site with information matching a term or pattern, not necessarily a good site. Plagiarism is not a new problem and, as many have found, search engines can be instrumental in identifying plagiarism. The site Copyscape which you pointed out to me makes great use of Google’s API to do exactly that. > So the system can (and will eventually) balance itself. I disagree, not until â€œanonâ€ publications and copied crap is unindexed from the search engines. If Iâ€™m using Google to find technical information I give zero credibility to anonymous sources, and it would be great to have a â€œcredibleâ€ way to search the web for people, so they can find stuff from folks like us, who publish our credentials. And you should not give credibility to a source just because Google finds it. That’s not Google’s job. Google’s job is to find pages (every page if possible) that match the terms you’re entering. Popular sites are weighted to show up earlier in the results, but yes, only because they are popular. Wikipedia is the enemy of anyone who wants to find credible data on the web, and they are actively seeking to pollute the web with anon garbage. I think it’s unlikely that Wikipedia is actively trying to pollute the web. Wikipedia is fundamentally flawed for many of the reasons you mention but it remains accurate on many topics. There is no disguising of what it is and it has been largely condemned as an academic resource, but when I need a quick ‘starting point’ reference or the answer to some pop-culture trivia it’s still the place I go. Itâ€™s the balance between free speech and credibility. Just the raw link-to counts are deceiving. I hear that the #1 Oracle blogger got there only because he wrote a hugely successful blog template, totally unrelated to his Oracle content quality. Actually, I think you’ll find that the #1 Oracle blog you mention is actually the non-topical personal blog of an Oracle administrator. 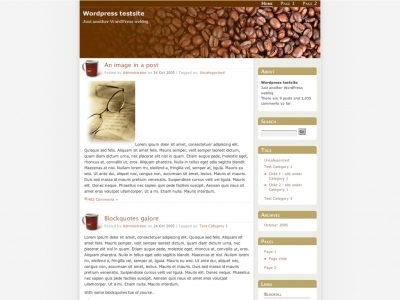 The point that he composed an attractive and well written WordPress theme is a testament to the quality of his work. The solution is simple. Sooner or later, someone will come-up with a â€œverified credentialsâ€ service where netizens pay a free and an independent body verifies their college degrees, published research, job experience and other qualifications. Verified credentials would only solve one small piece of the problem. Many people with verifiable credentials are still dead wrong and/or cannot communicate their ideas efficiently enough to be what I consider a good resource. An even simpler solution already exists. Leading organizations like the Independent Oracle User’s Group could take it upon themselves to compile and publish lists of quality resources in their field. With some additional effort I bet these lists could be combined with Google’s search API to provide a web search which only searches a number of “verified” sites. This type of compilation would not only provide a fantastic list of resources (especially for beginners) but would also shape search results by increasing the page ranking of sites which the organization identifies as good resources.